Do you have a teen that wants to have a pair of these bleached denim shorts? If you look at them in the stores, they are expensive, they are VERY SHORT and they are damaged (on purpose!). 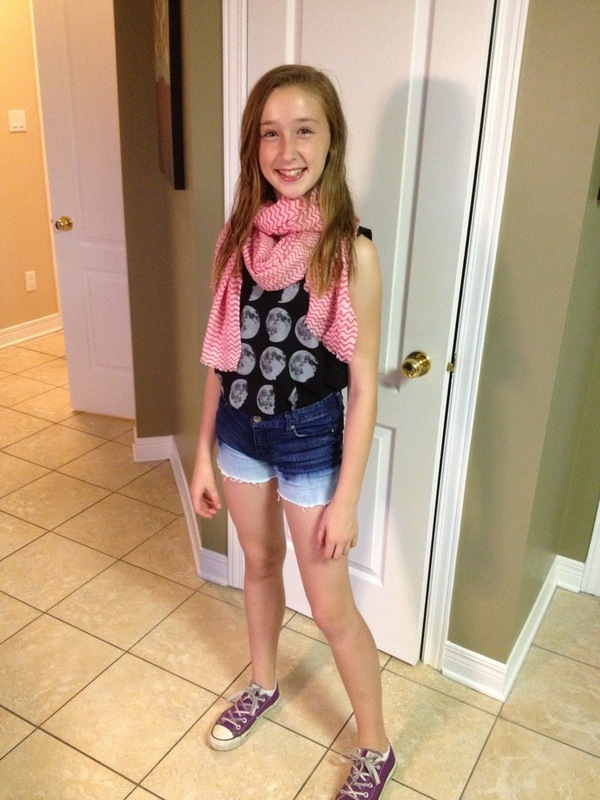 So DD used an old pair of jean capris that were getting too small and cut them into shorts. While they are not long enough to pass the middle finger test, they pass the summer test and are not indecent. These were so easy to bleach and other than a bit of help from me, DD did them mostly on her own. 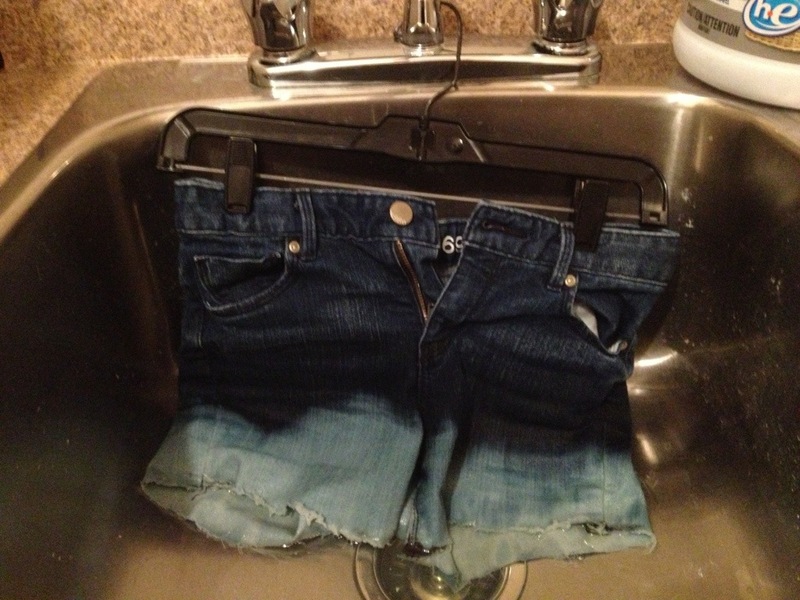 Hang the shorts on a clip hanger and adjust them so they are hanging into a bucket or a laundry sink. Add bleach to the sink or bucket approx 2 inches below where you want the bleach, since it will bleed upwards higher than you think. 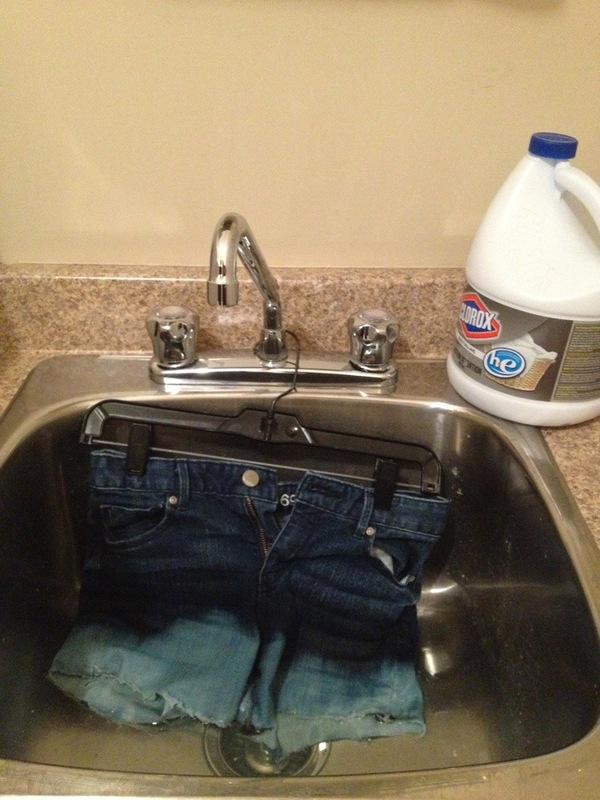 Let the shorts sit in the bleach for 20-30 mins. We turned on the fan since all that bleach gets smelly. Once they have soaked in bleach, rinse them REALLY well so all the bleach is rinsed out – you will want to use gloves for this part. 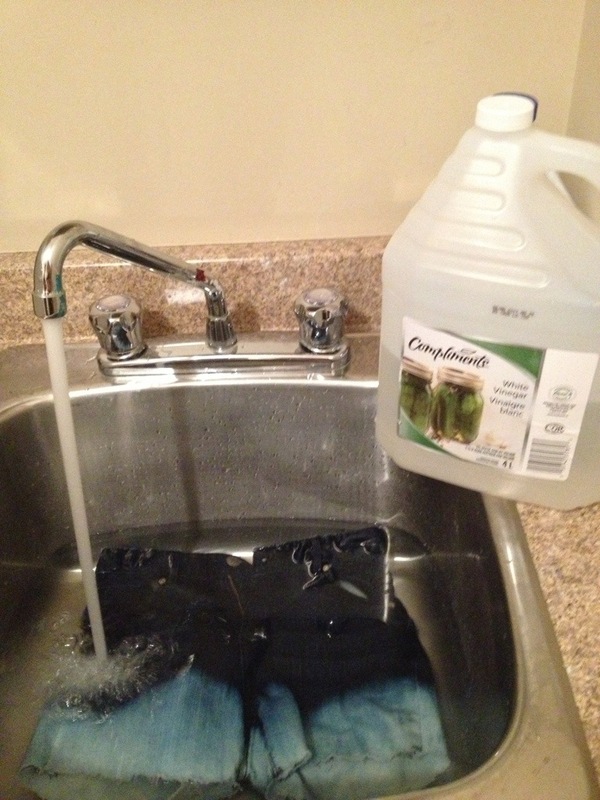 It is super important to rinse all the bleach out, since the next step is to wash the shorts with water and vinegar. Vinegar and bleach can create a noxious gas, so RINSE WELL. We let the shorts sit in Vinegar and water for 10-15 mins and then we washed them in the washer (alone) and dried them in the dryer. The instructions said to wash them twice, but we only washed them once. Now DD is totally happy with her “new” shorts. She did use a nail file to rough up the ends a bit. You can take a pair of scissor to them and damage them to your heart’s desire, but I really don’t quite get that (I’m not hip I guess). But DD is happy and it was easy peasy! Wonderful day! Spring weather makes you fall right back in love with Newfoundland. Just like that! Both on stage for Carmina Burana tonight. Not sure how many more times that might happen so appreciating these moments. My little family this am. I’m going to pretend they were all like this 🤣. I really am a sucker for a happy ending. Just watched the last of the Kimmie Schmidt episodes. Anyone else watch it?